1. Applied to a bill for Rs. 2,00,000, the difference between a discount of 40 % and two successive discount of 36 % and 4 % is? 2. The total area of a circle and rectangle is 991 Sq cm. The radius of the circle is 14 cm. What is the sum of the circumference of circle and perimeter of rectangle, if length of the rectangle is 25 cm? 3. Sree and Subha entered into a partnership with an investment of Rs. 30000 and 40000 respectively. At the end of 4 monthly Sree withdraw 10000 and Subha invested Rs. 10000 more. Find the share of Subha, if the total profit at the end of the year is Rs. 36000. 4. Ravi spent 40% of his salary on food, 25% of the remaining on clothes, 35% of the remaining on miscellaneous expenditure. If he saves Rs. 58500, find the average amount he spent on food and clothes? 5. A bag contains 4 red marbles, 5 yellow marbles and 6 pink marbles. If three marbles are taken at random, than what is the probability that 2 marbles are pink? 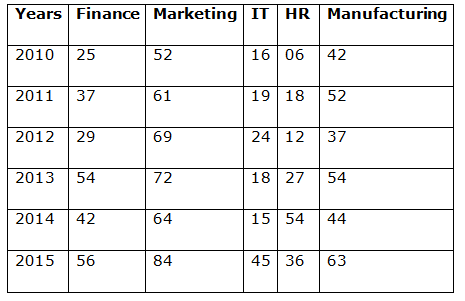 Directions (6 - 10): Study the following table carefully to answer the questions that follow: Number of employees retired from a company ABC during 6 different years. 6. What is the difference between the total number of employees retired from Finance Dept in the year 2012, 2013 and 2014 and the number of employees retired from marketing dept in the year 2014? 7. Total number of employees retired from Manufacturing in the years 2011 and 2012 together was approximately what per cent of the total number of employees retired from IT over all the years together? Total number of soldiers retired from IT over all the years together. 8. What was the average number of employees retired together in the year 2013? 9. In which department the number of the employees retired continuously increased from the year 2010 to 2015? 10. What was the respective ratio between the number of employees retired from Marketing in the year 2013 and number of employees retired from HR Dept in the year 2014? 1) Applied to a bill for Rs. 2,00,000, the difference between a discount of 40 % and two successive discount of 36 % and 4 % is? 2) The total area of a circle and rectangle is 991 Sq cm. The radius of the circle is 14 cm. What is the sum of the circumference of circle and perimeter of rectangle, if length of the rectangle is 25 cm? 3) Sree and Subha entered into a partnership with an investment of Rs. 30000 and 40000 respectively. At the end of 4 monthly Sree withdraw 10000 and Subha invested Rs. 10000 more. Find the share of Subha, if the total profit at the end of the year is Rs. 36000. 4) Ravi spent 40% of his salary on food, 25% of the remaining on clothes, 35% of the remaining on miscellaneous expenditure. If he saves Rs. 58500, find the average amount he spent on food and clothes? 5) A bag contains 4 red marbles, 5 yellow marbles and 6 pink marbles. If three marbles are taken at random, than what is the probability that 2 marbles are pink? Number of employees retired from a company ABC during 6 different years. 6) What is the difference between the total number of employees retired from Finance Dept in the year 2012, 2013 and 2014 and the number of employees retired from marketing dept in the year 2014? 7) Total number of employees retired from Manufacturing in the years 2011 and 2012 together was approximately what per cent of the total number of employees retired from IT over all the years together? 8) What was the average number of employees retired together in the year 2013? 9) In which department the number of the employees retired continuously increased from the year 2010 to 2015? 10) What was the respective ratio between the number of employees retired from Marketing in the year 2013 and number of employees retired from HR Dept in the year 2014?